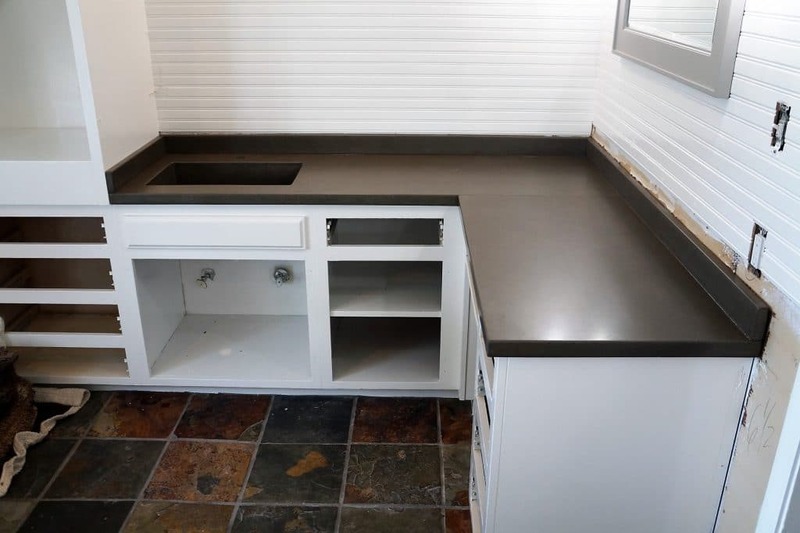 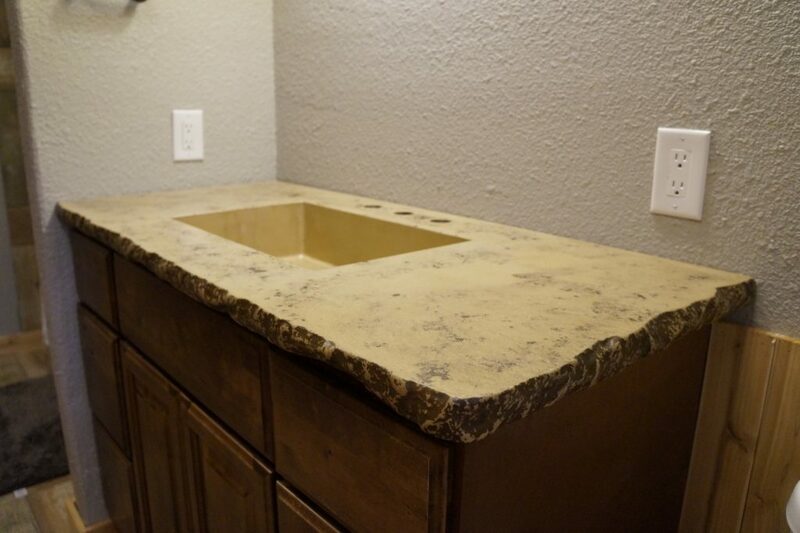 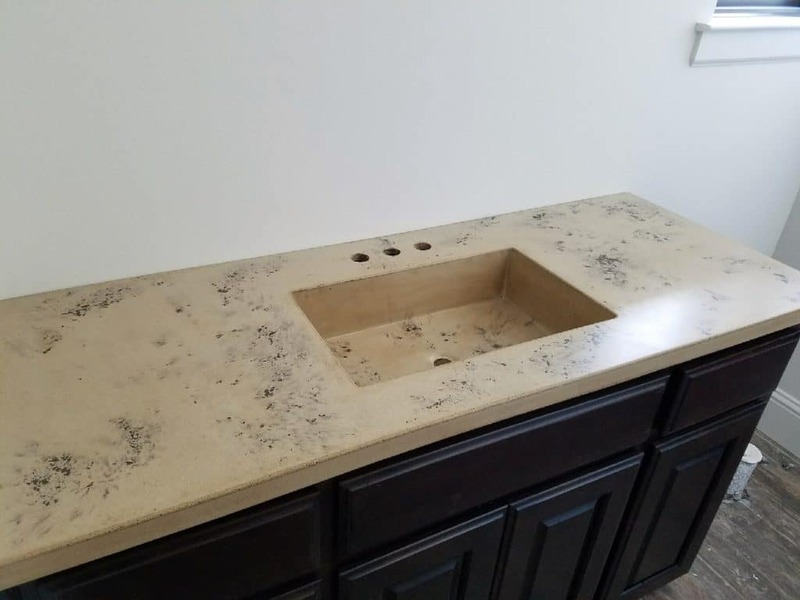 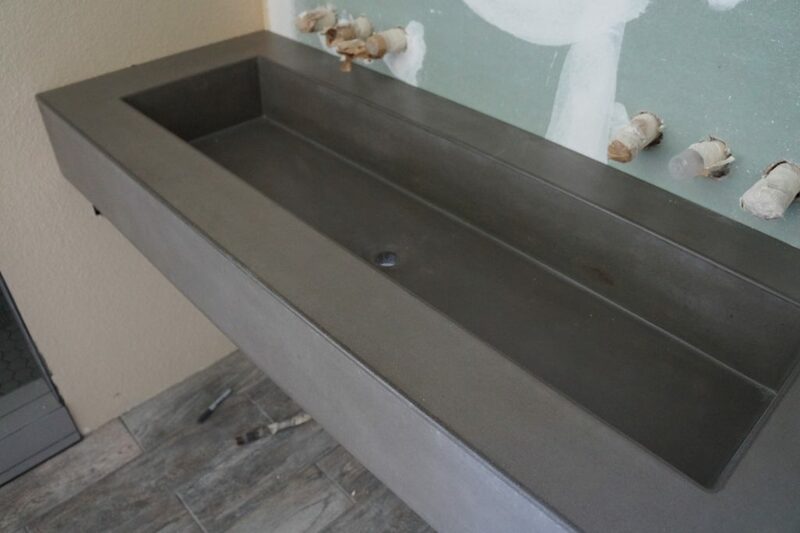 Custom rock edge concrete sink that we installed in a home in Weatherford, Tx. 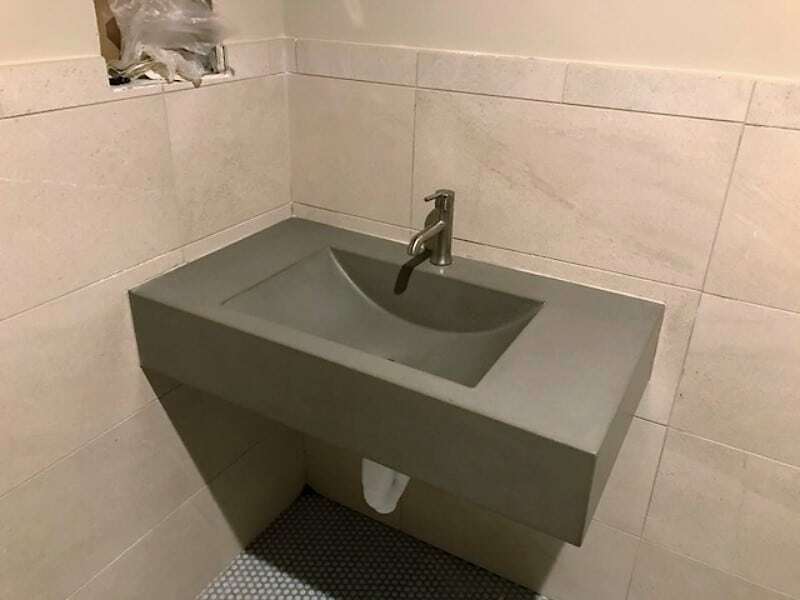 The only one of its kind. 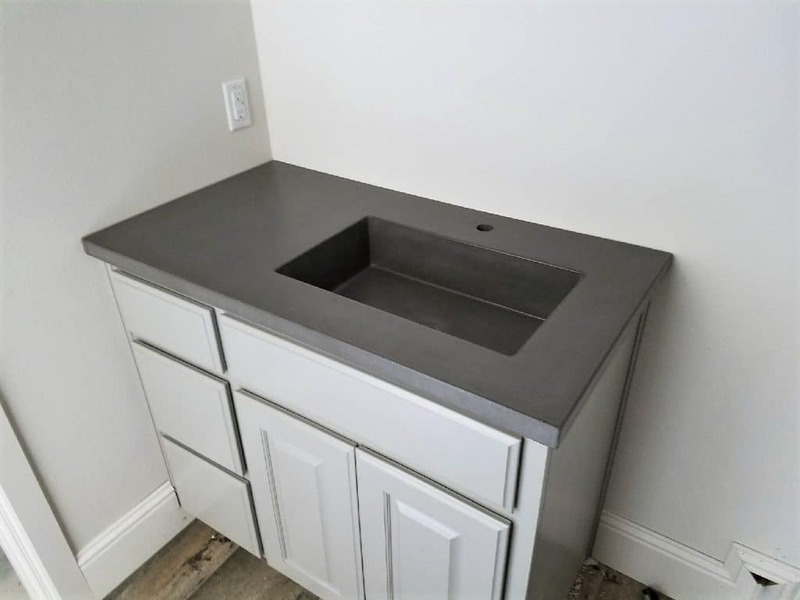 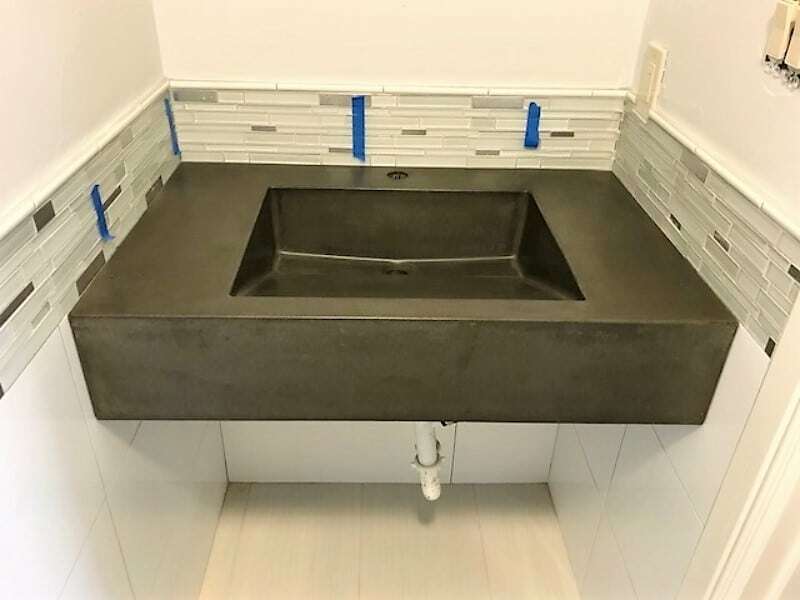 Dark grey floating concrete sink with matching backsplash. 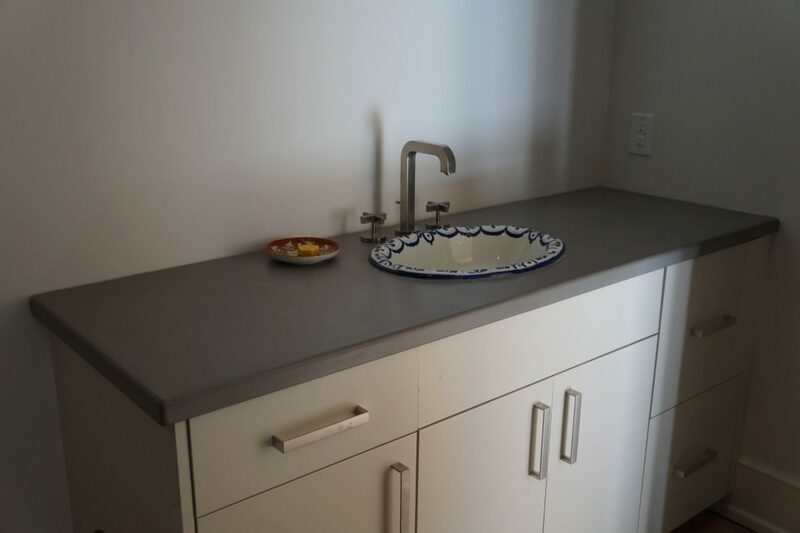 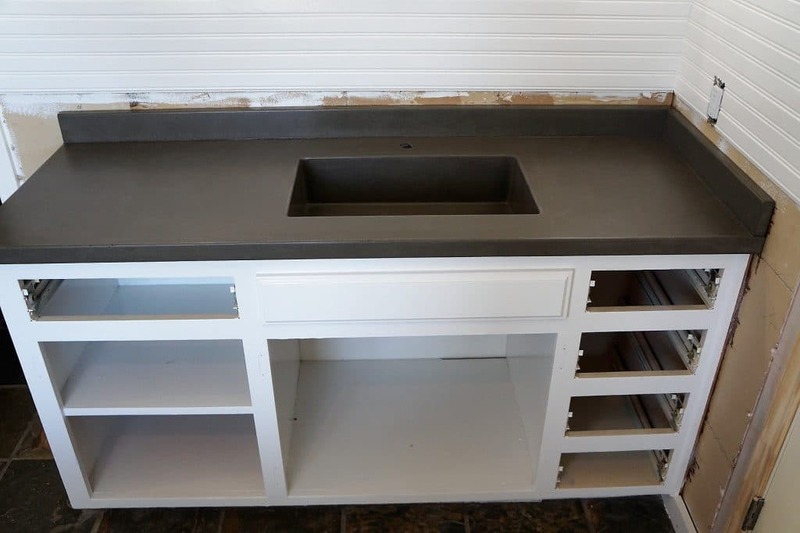 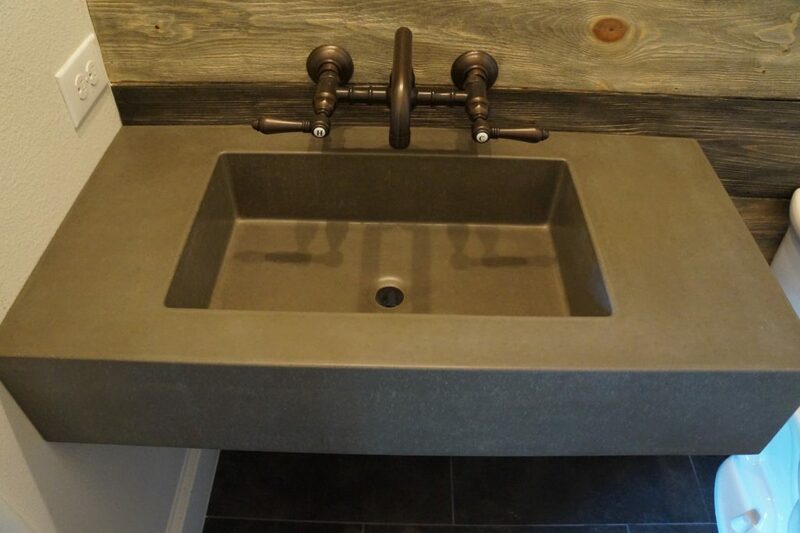 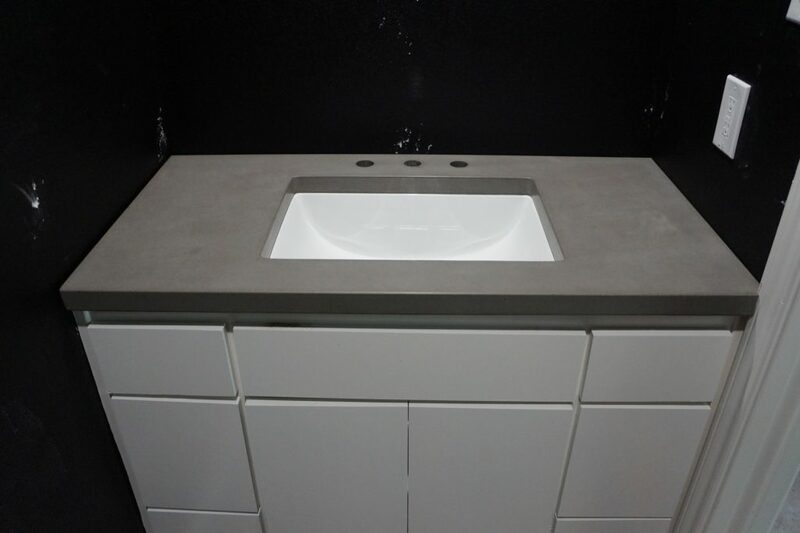 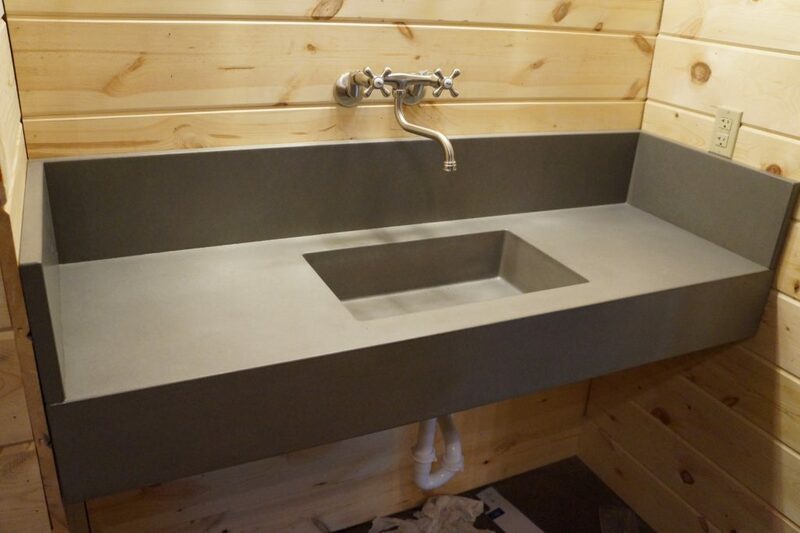 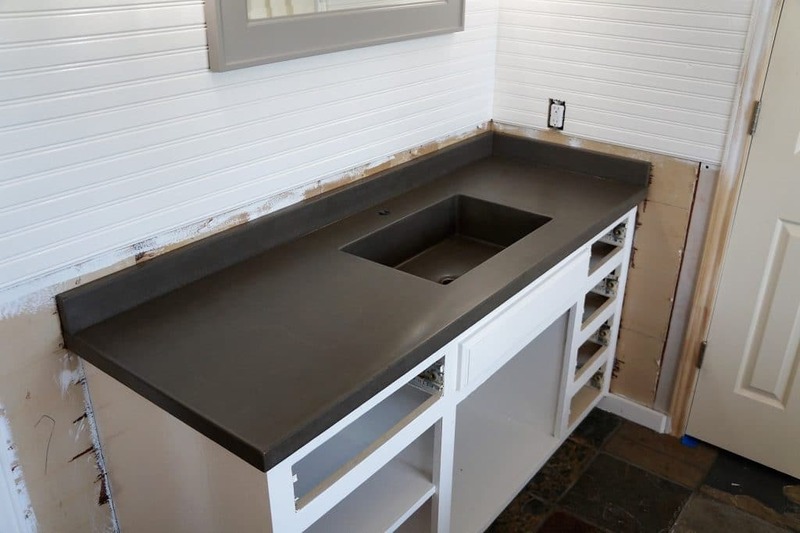 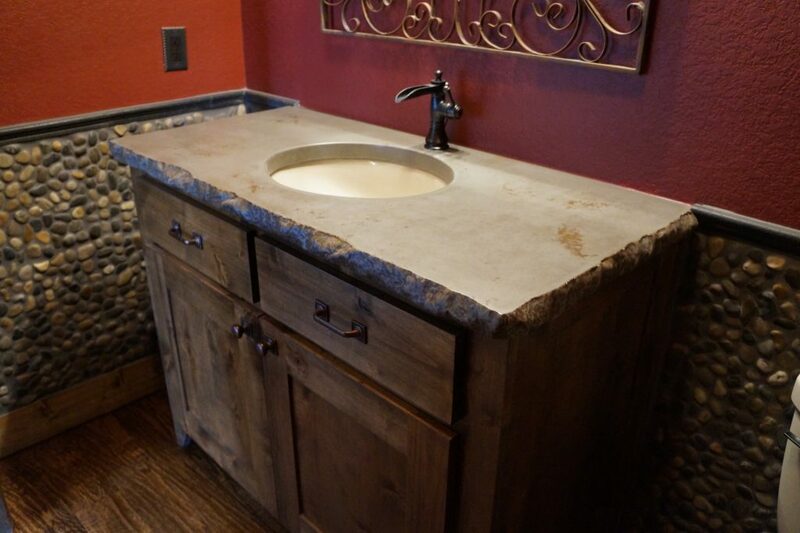 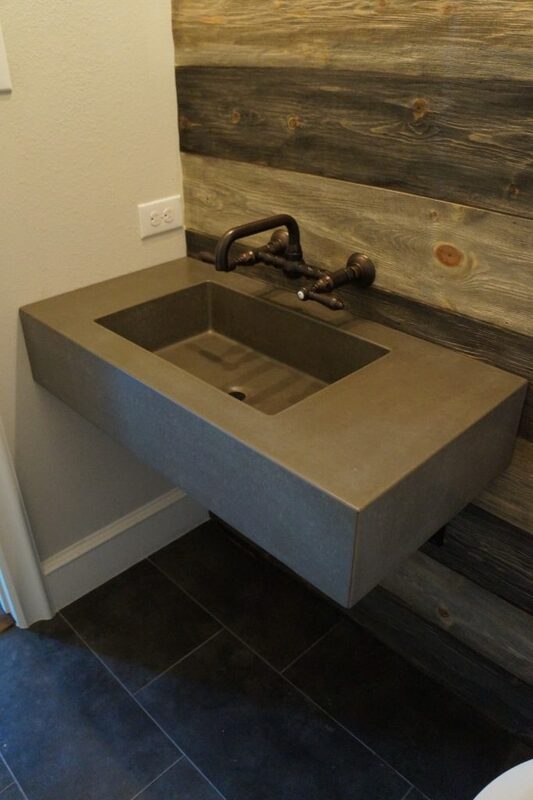 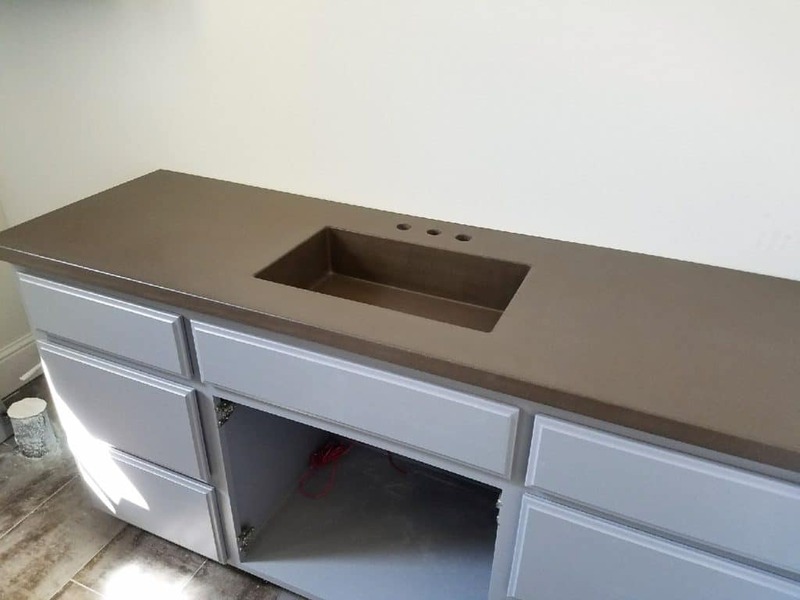 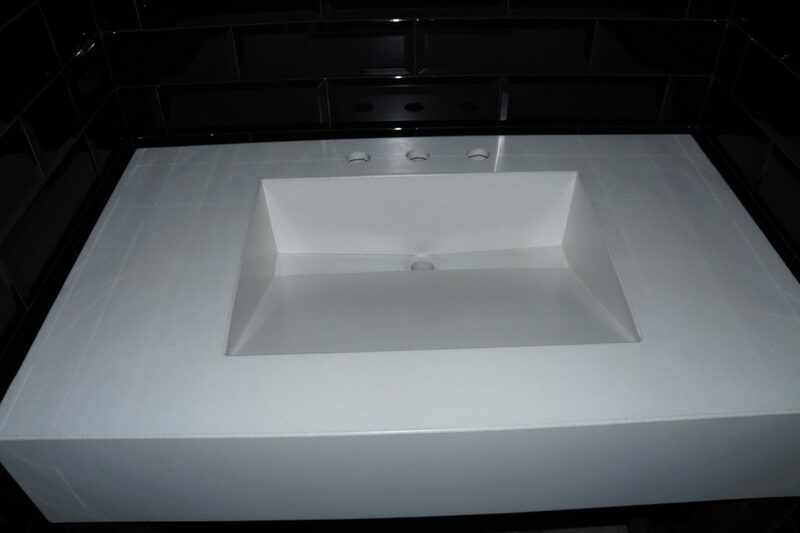 We love getting updated pictures of our concrete sinks and countertops from clients! 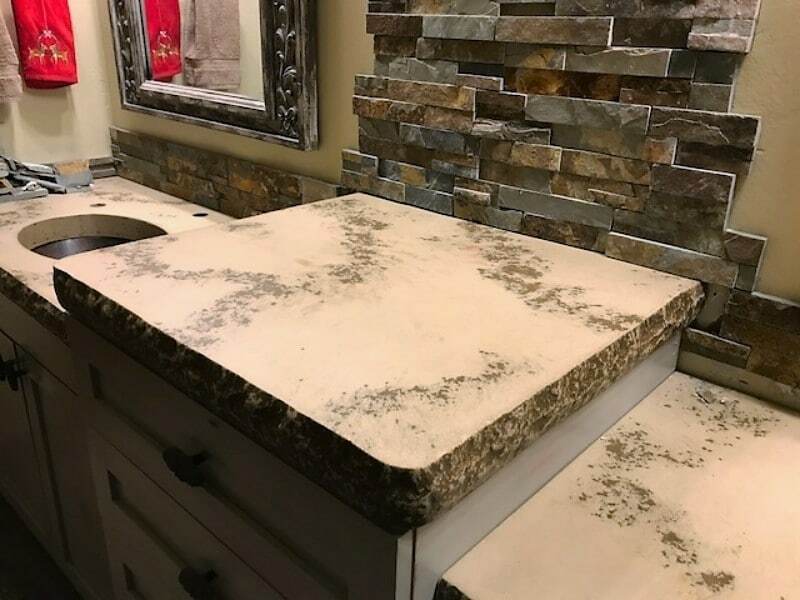 This is one of our most popular styles for countertops with chiseled edge, light tan with dark brown veins running through it. 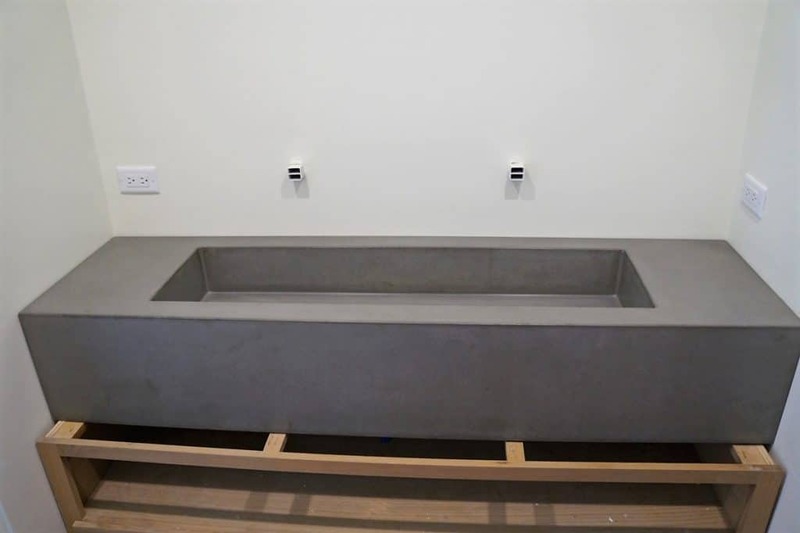 This is the most intrecate concrete sink we have ever made. 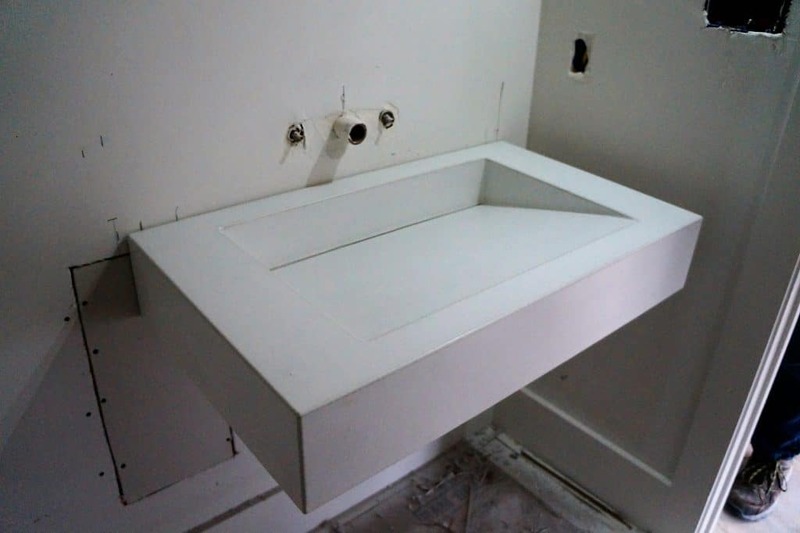 This sink was created in 1 piece, from the 4 inch thick drop leg, to the sloped edge on the front of the sink. 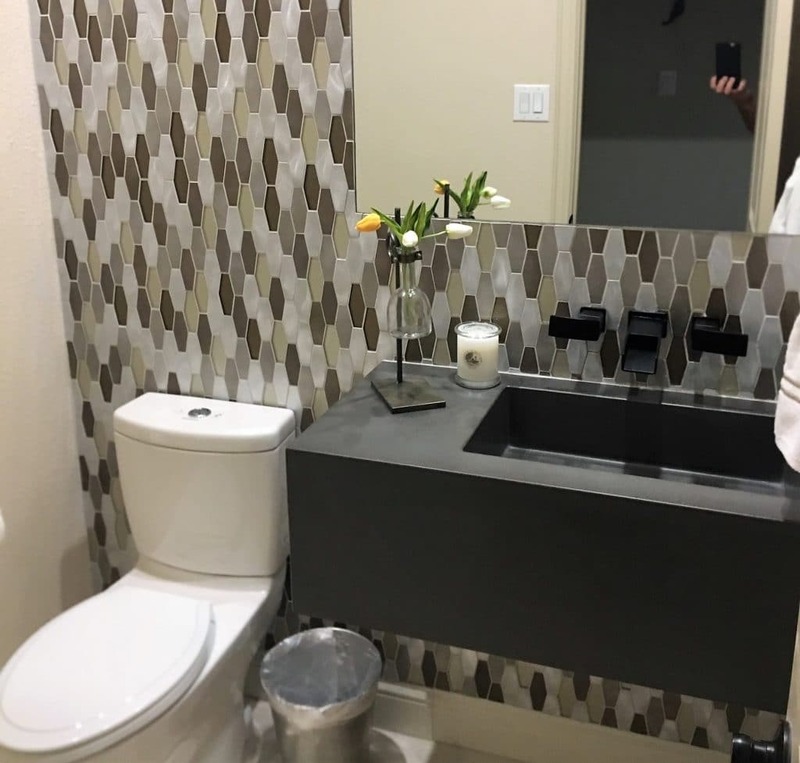 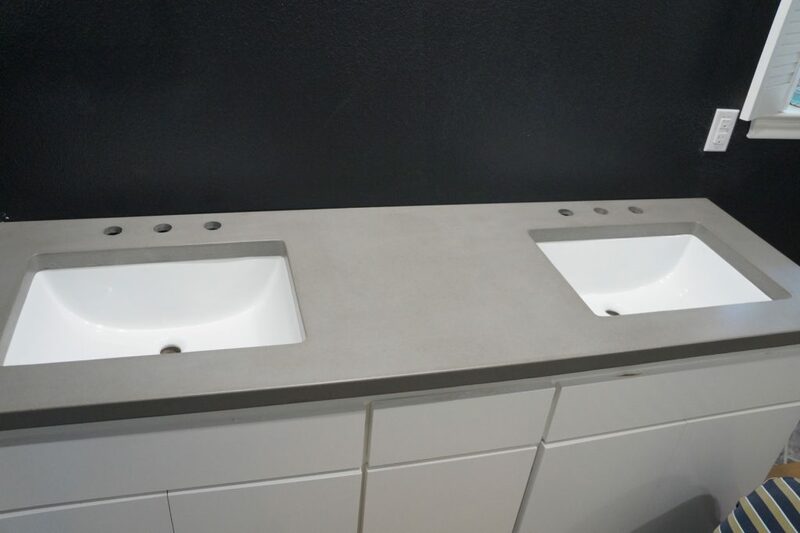 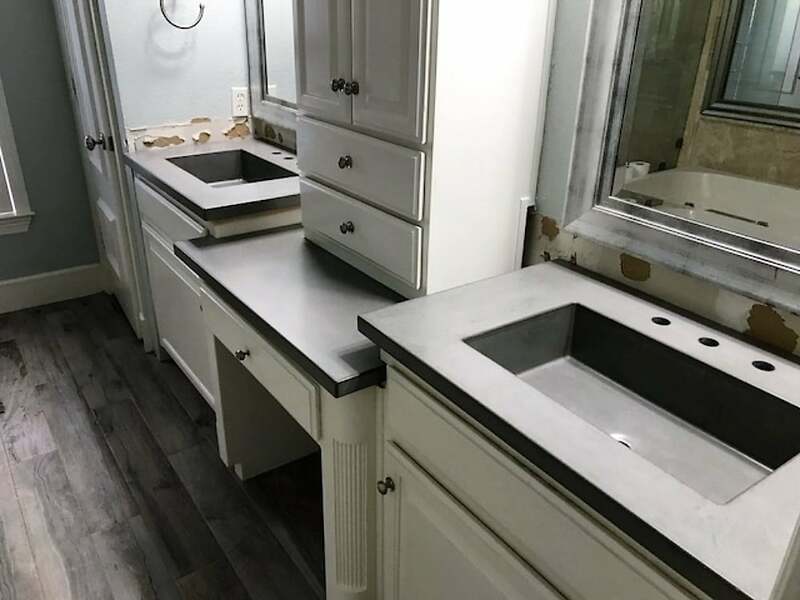 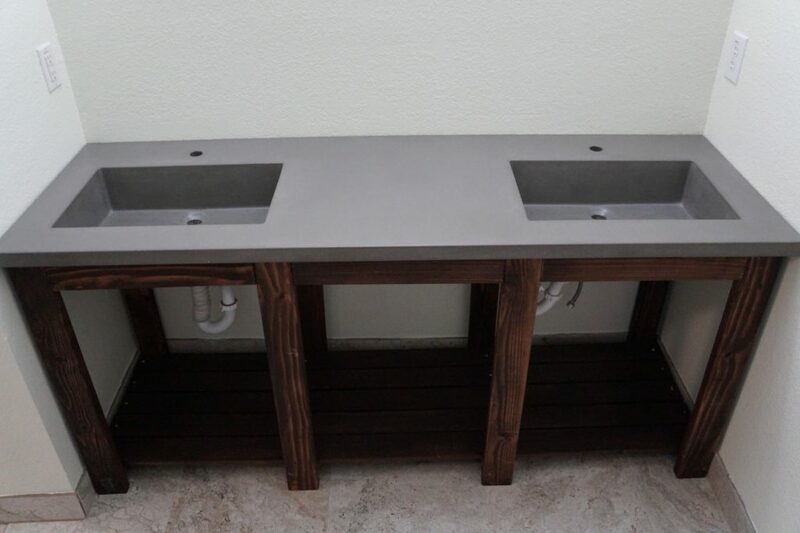 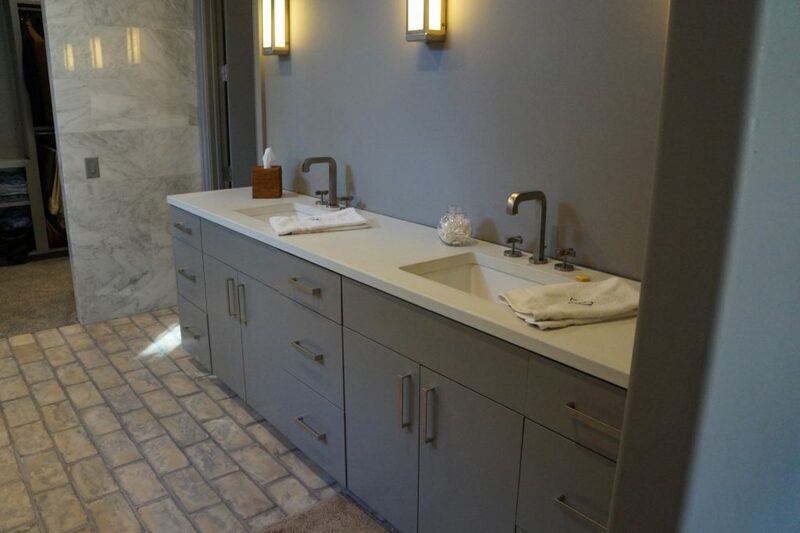 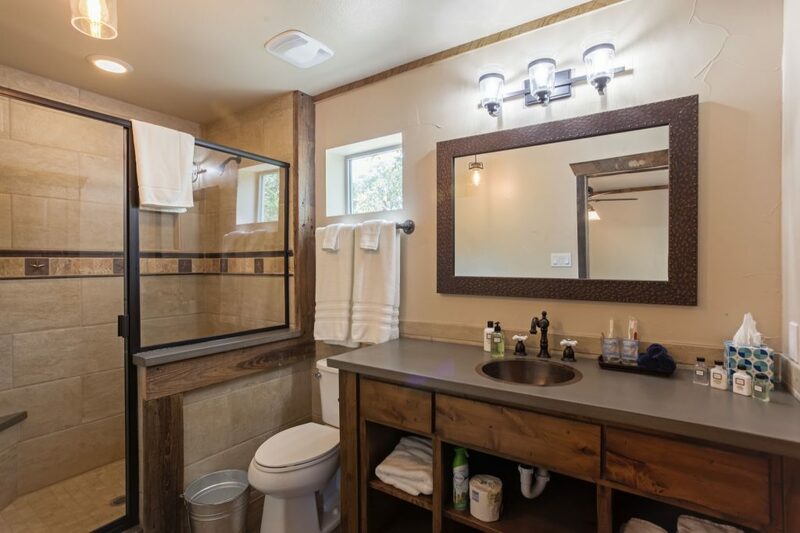 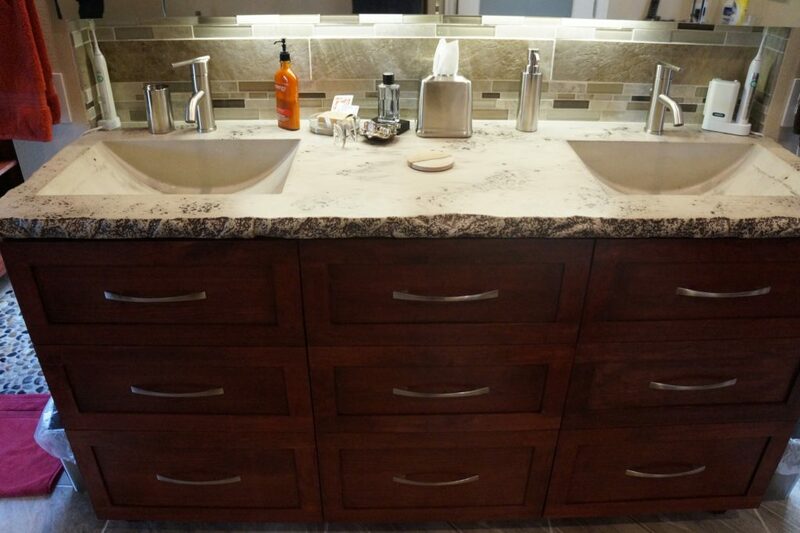 Dual Concrete Vanities with our 20"x12" sink, and lower level concrete countertop. 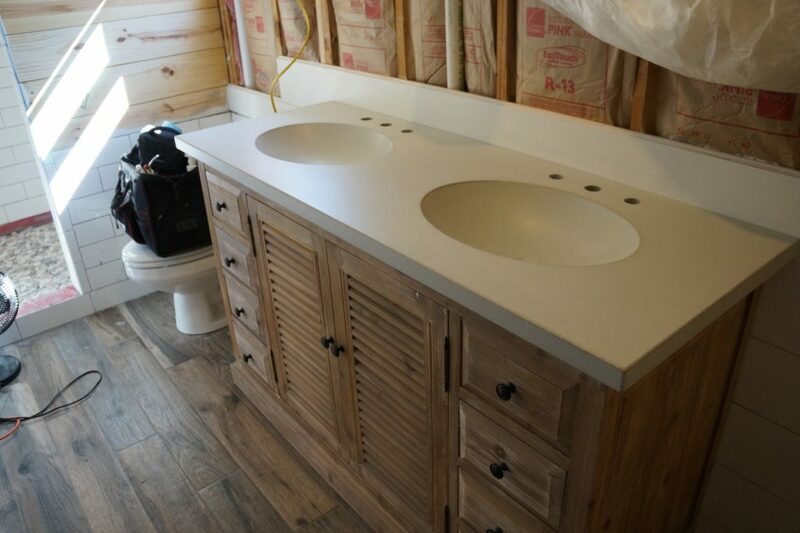 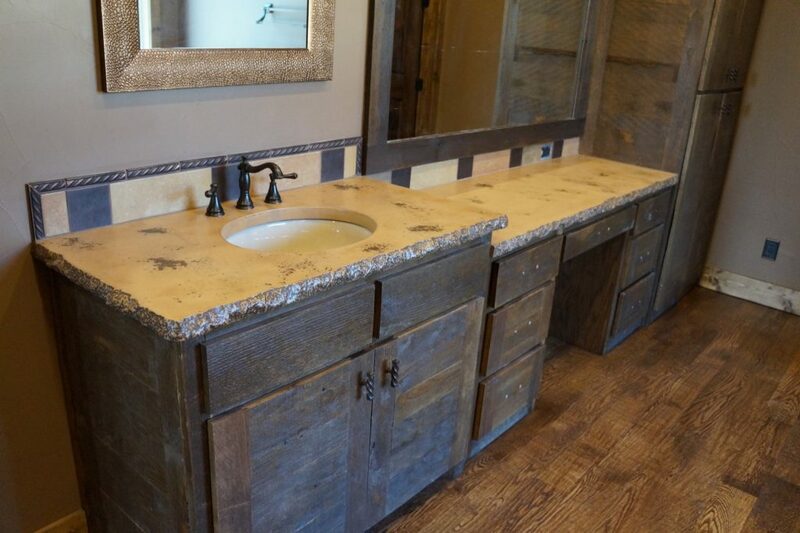 The third bathroom sink for the Heath house. 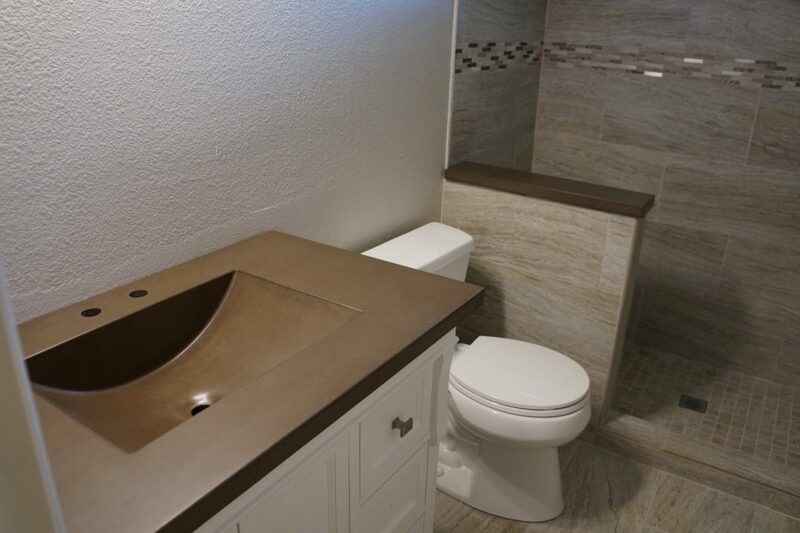 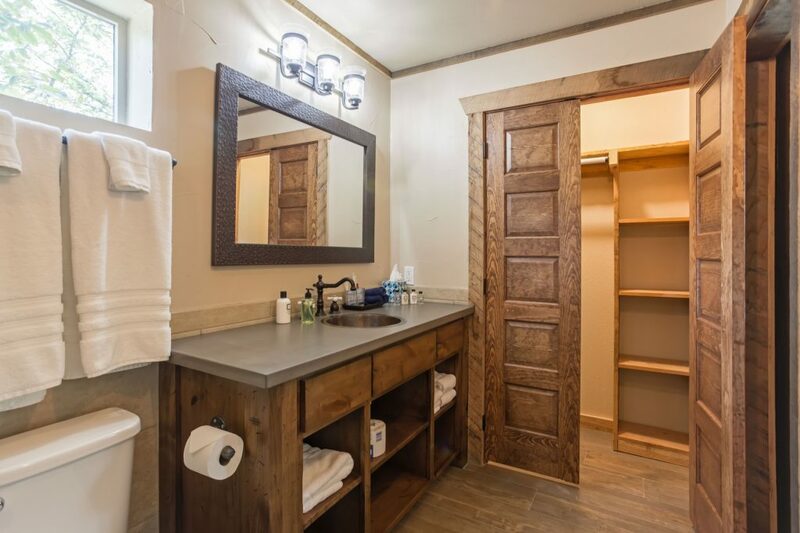 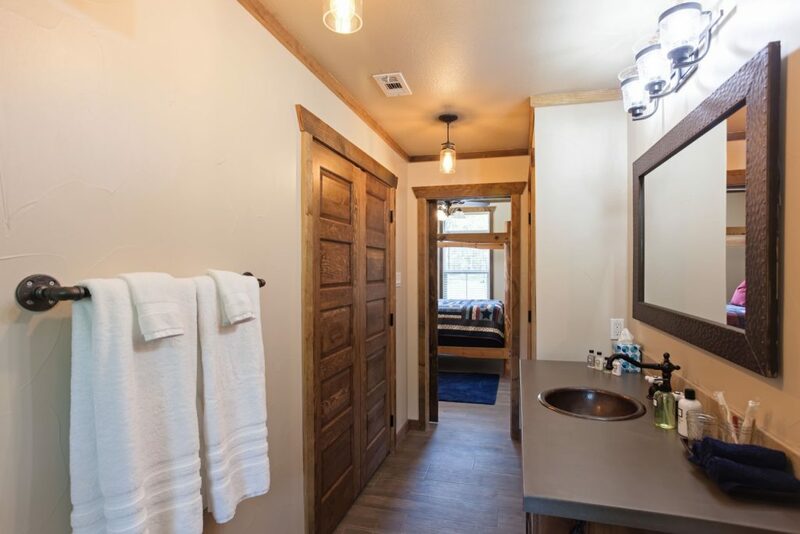 This client opted for a different color and style for each bathroom to give each a unique feel. 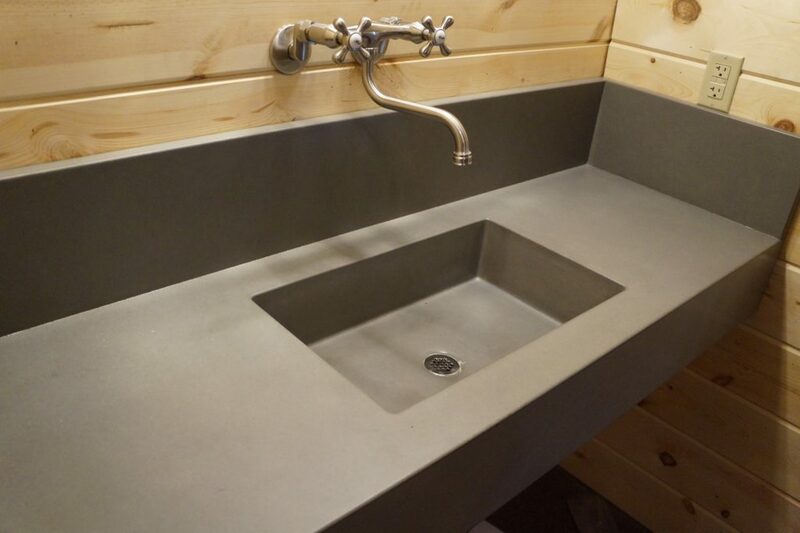 Concrete Countertop with our 20"x12" concrete sink. 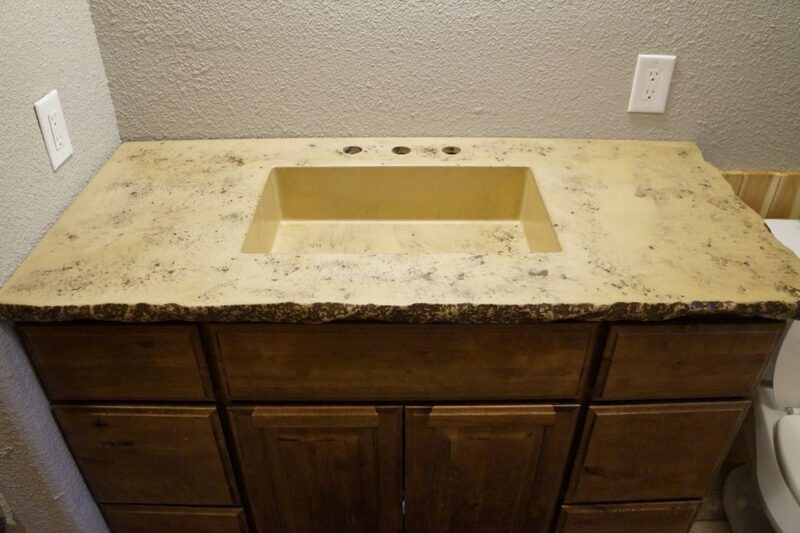 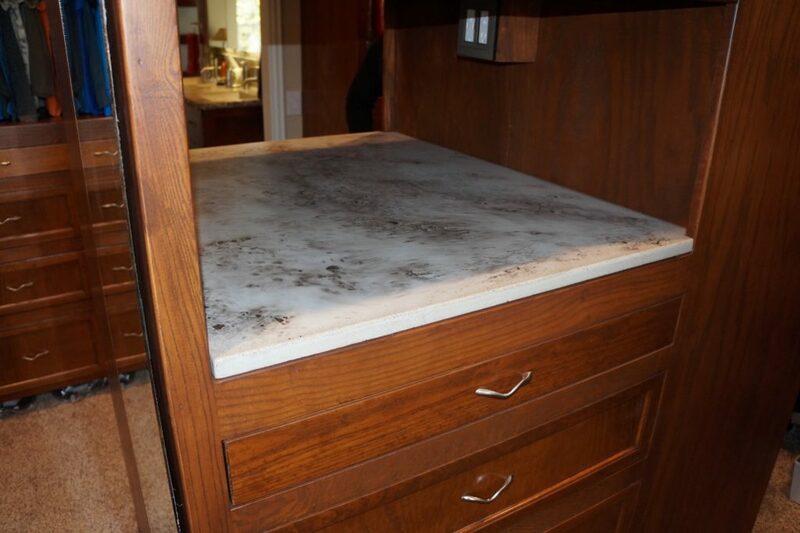 This countertop has a brown fill scattered randomly across the top. 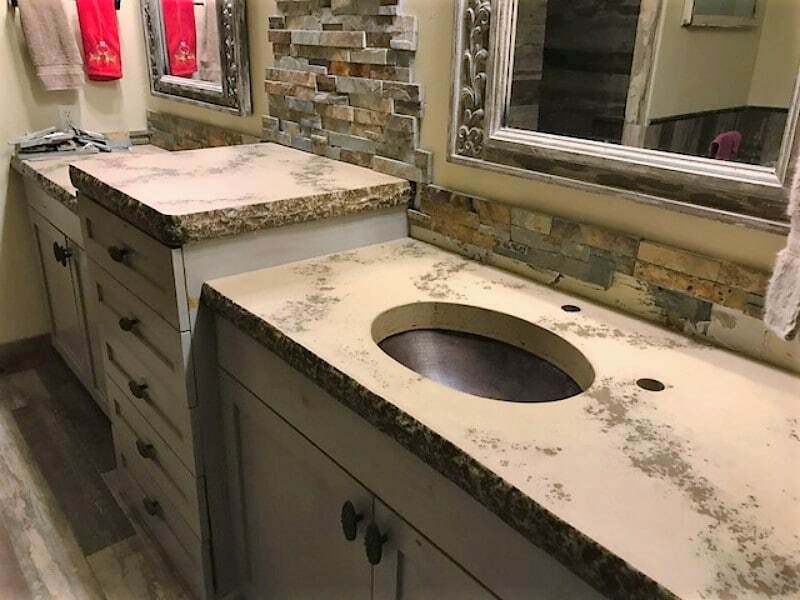 This went into a home in Heath, Tx. 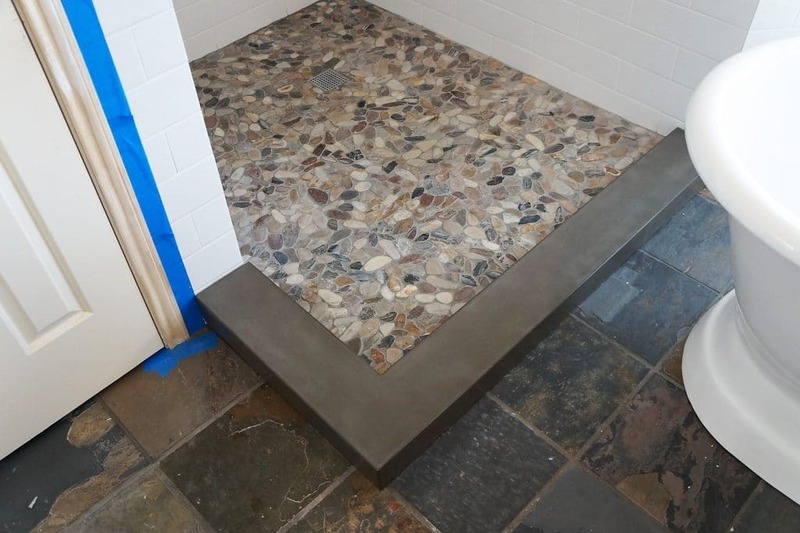 Custom Concrete shower threshold in Collinsville, Tx. 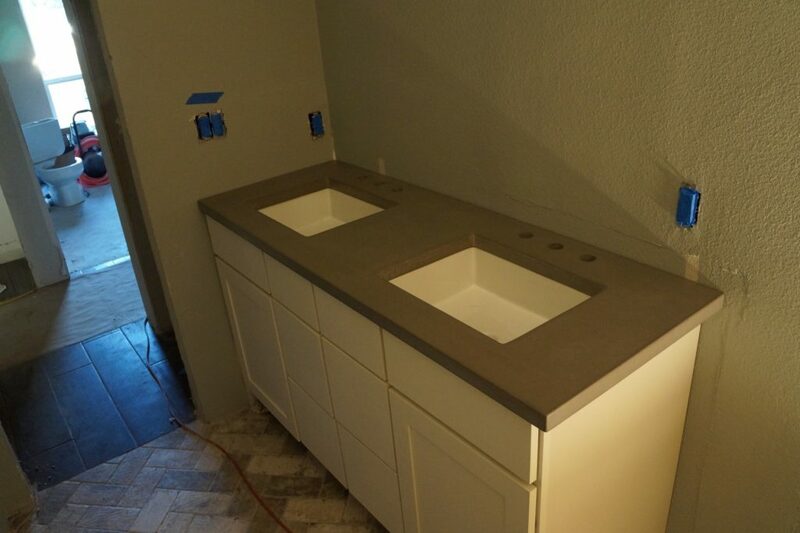 These Countertops were made with a matching 3" tall backsplash. 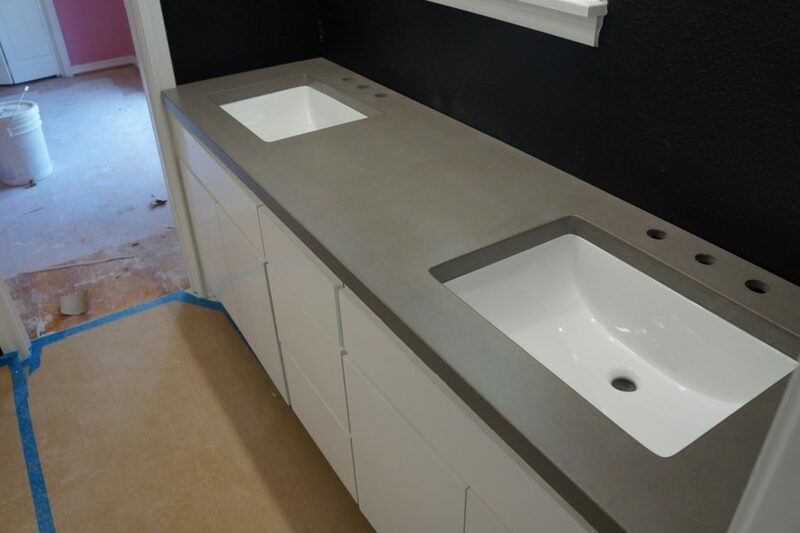 Concrete Countertops with integrated 20"x12" square sink installed in a home in Collinsville, Tx. 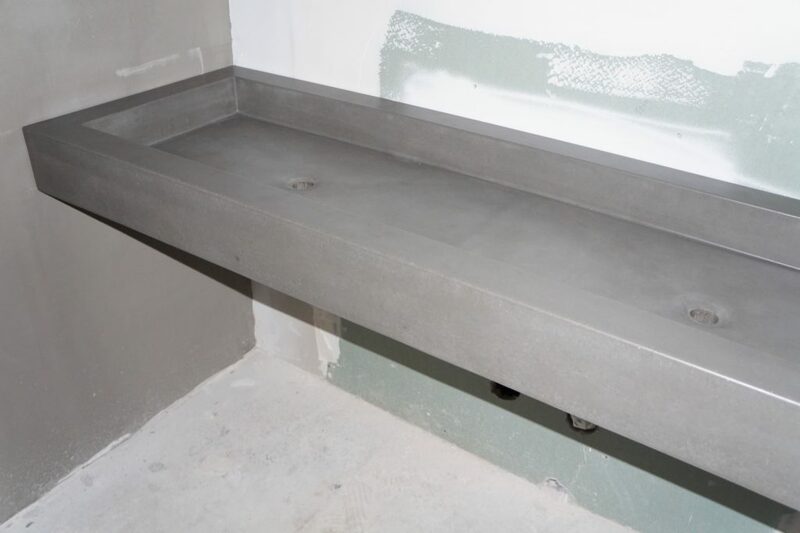 Concrete Trough sink installed in Coppell, Texas. 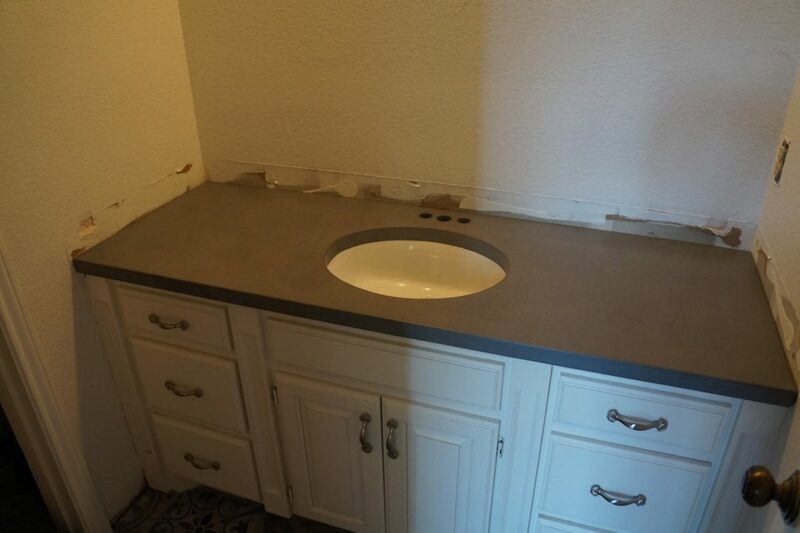 This sink is 44 inches wide. 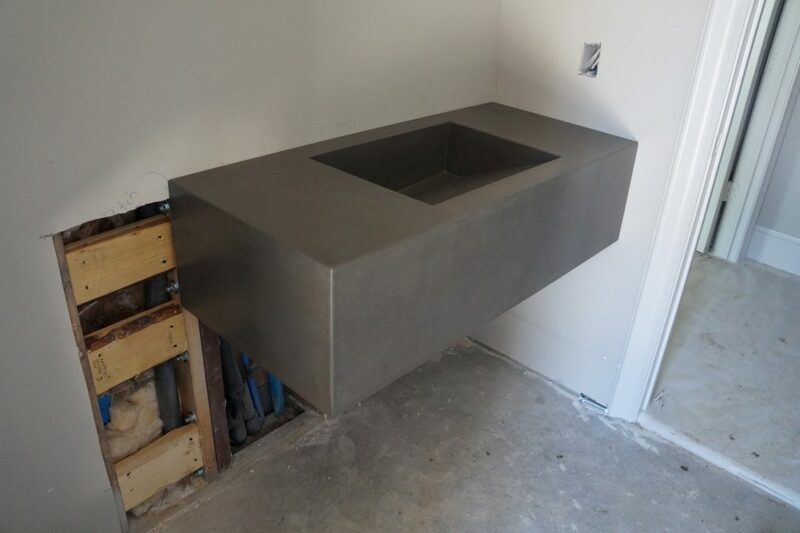 Floating Concrete Sink with our 20" x12" rectangular sink. 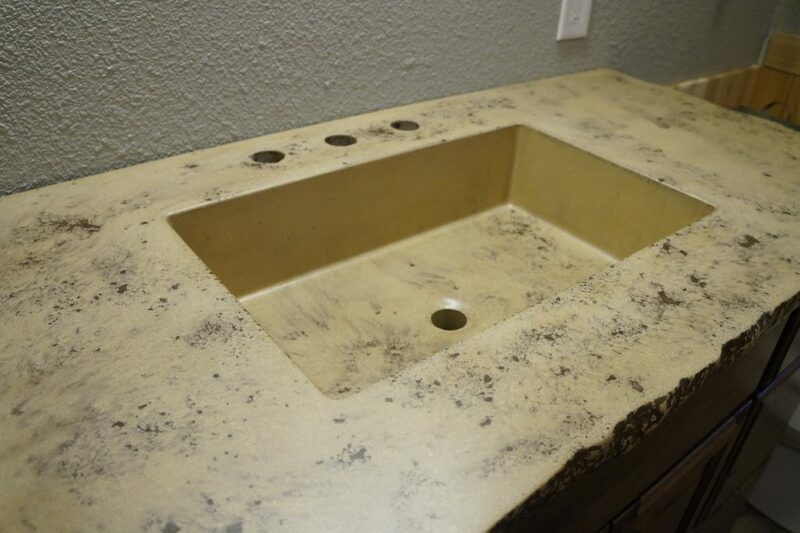 This is what we call our Dirty White colored concrete countertops with two oval, integral sinks. 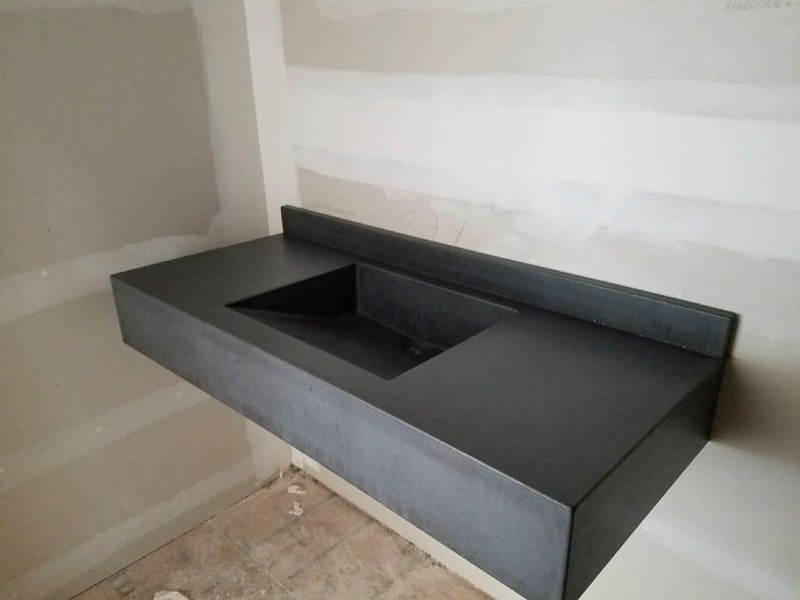 This was installed in McKinney, Texas. 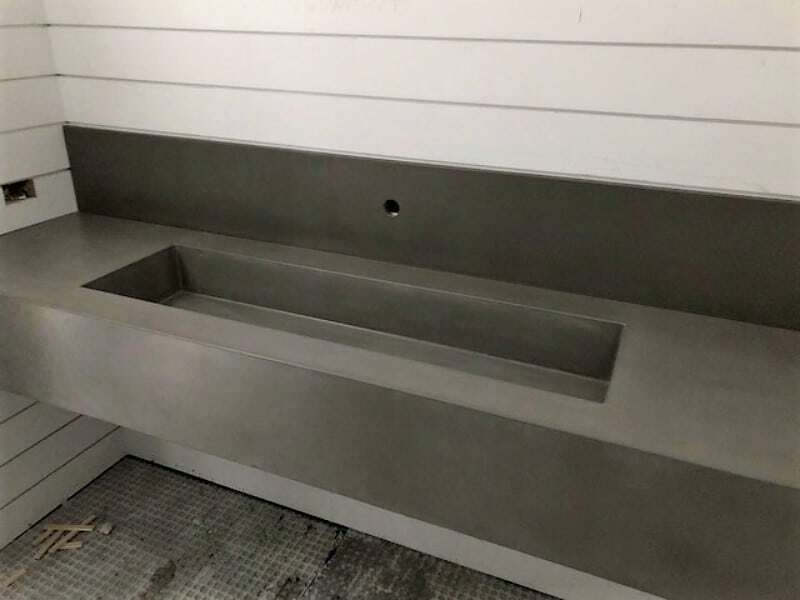 This picture shows the inside of the sloped ramp sink. 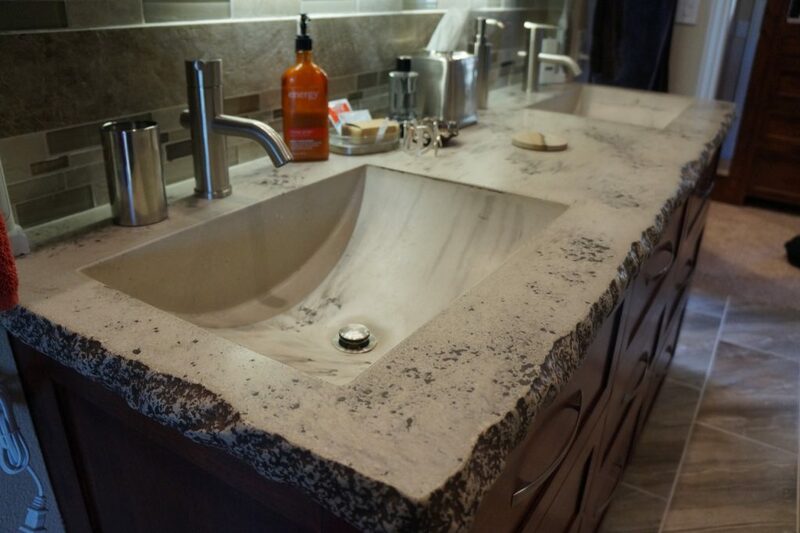 This is our most popular bathroom sink. 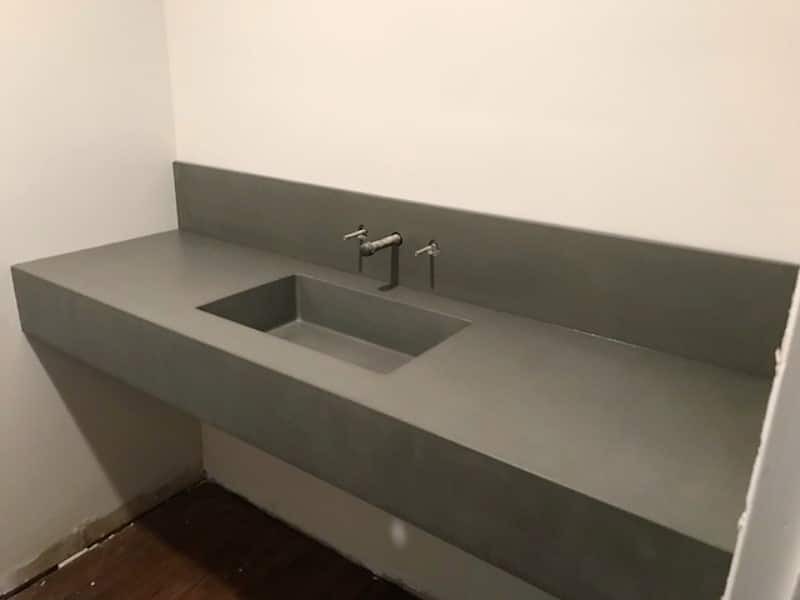 It's a 20" x 12" rectangular sink. 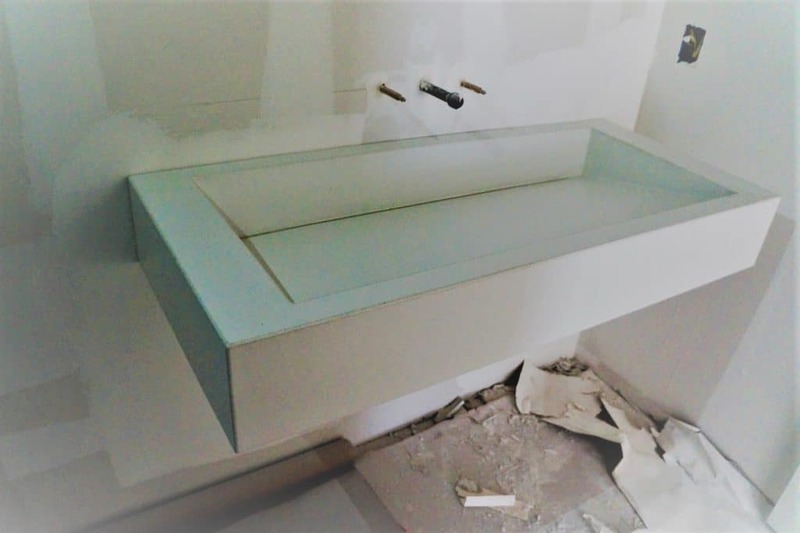 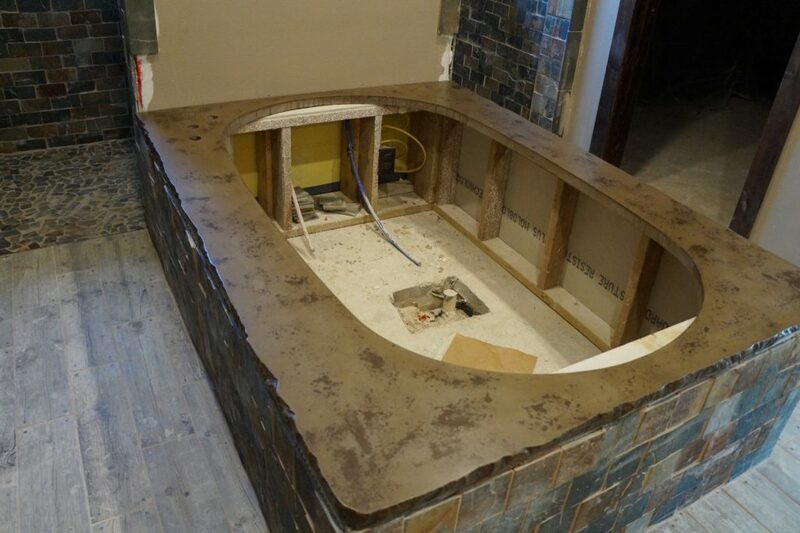 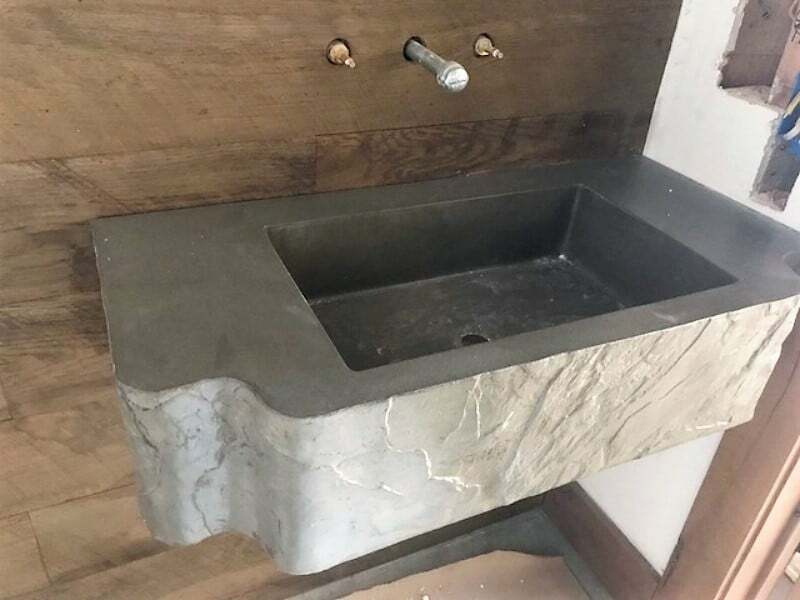 Concrete floating sink installed in a restaurant in Carrollton, Texas. 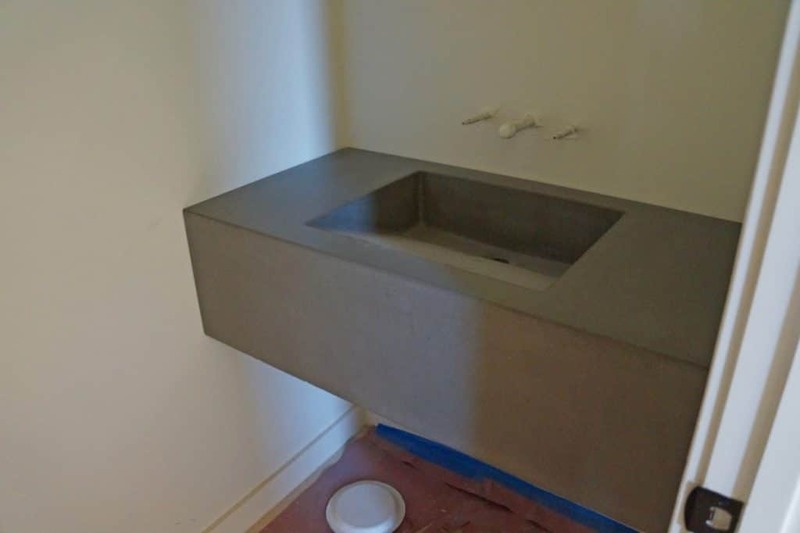 The actual sink is 60 inches wide with two drain holes. 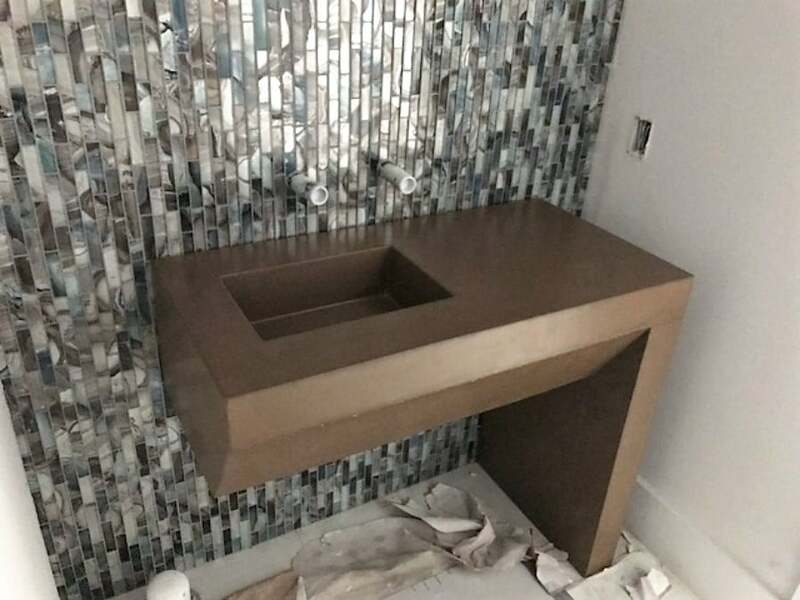 This color combination really makes the chiseled edge pop. 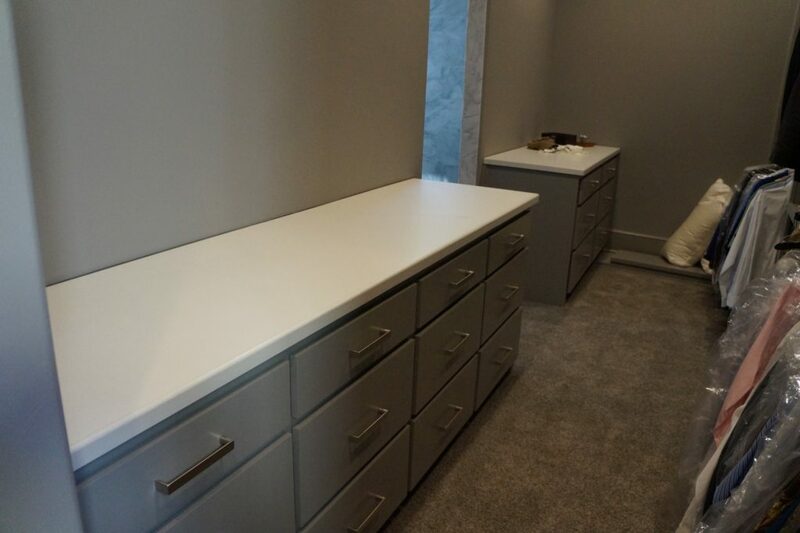 To tie it all in we made a matching shelf for the closet. 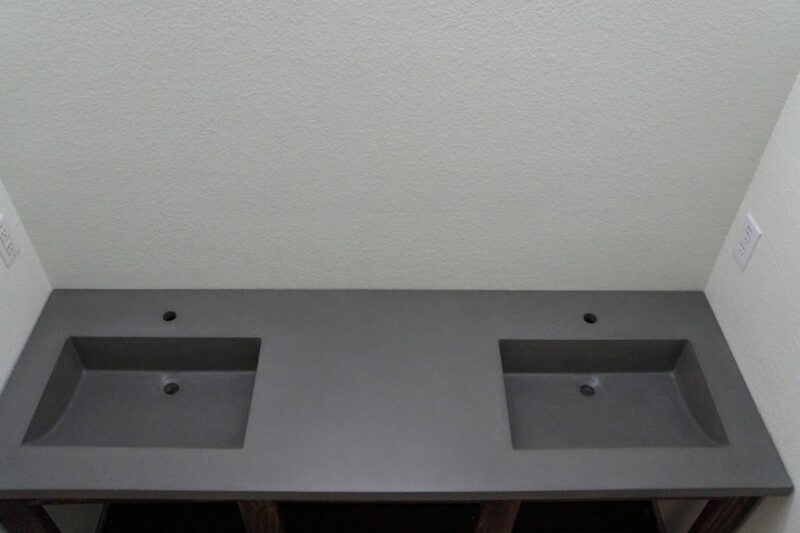 This picture shows the inside of the barrel sink.